A composition of matter for the recording medium of nanometer scale thermo-mechanical information storage devices and a nanometer scale thermo-mechanical information storage device. 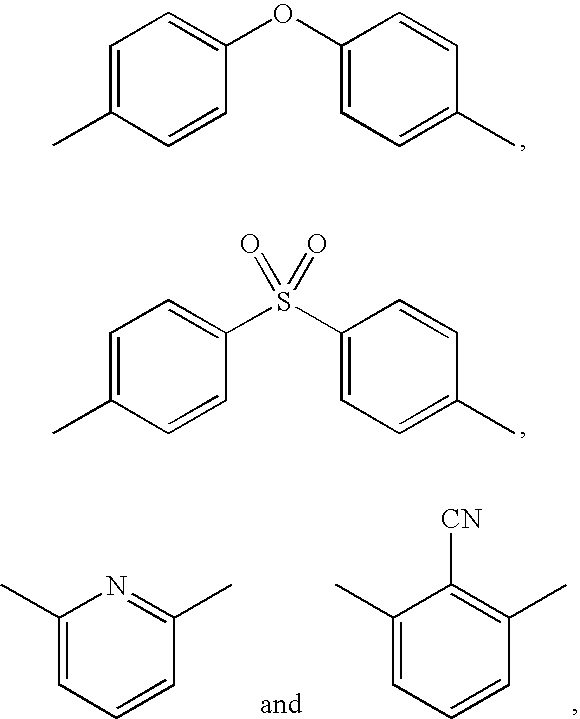 The composition includes: one or more polyaryletherketone copolymers, each of the one or more polyaryletherketone copolymers comprising (a) a first monomer including an aryl ether ketone and (b) a second monomer including an aryl ether ketone and a first phenylethynyl moiety, each of the one or more polyaryletherketone copolymers having two terminal ends, each terminal end having a phenylethynyl moiety the same as or different from the first phenylethynyl moiety. The one or more polyaryletherketone copolymers are thermally cured and the resulting cross-linked polyaryletherketone resin used as the recording layer in an atomic force data storage device. The present invention relates to the field of high-density data storage and read-back and more specifically to a data storage and read-back medium, a data storage and read-back system, and a data storage and read-back method. Current data storage and imaging methodologies operate in the micron regime. In an effort to store ever more information in ever-smaller spaces, data storage density has been increasing. In an effort to reduce power consumption and increase the speed of operation of integrated circuits, the lithography used to fabricate integrated circuits is pressed toward smaller dimensions and denser imaging. As data storage size increases and density increases and integrated circuit densities increase, there is a developing need for compositions of matter for the storage media that operate in the nanometer regime. 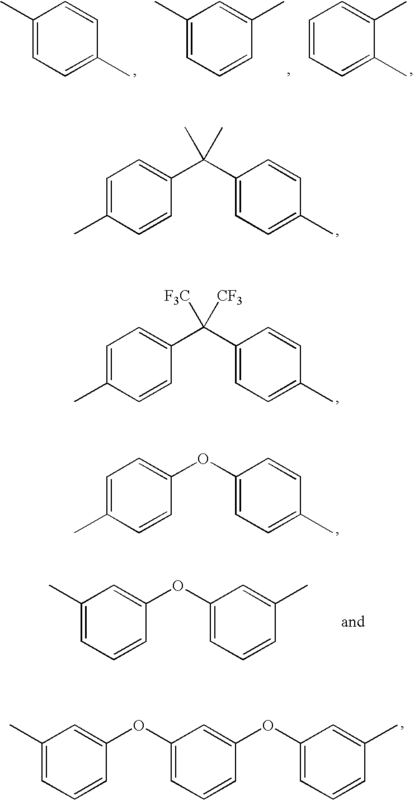 A first aspect of the present invention is a composition of matter, comprising: one or more polyaryletherketone copolymers, each of the one or more polyaryletherketone copolymers comprising (a) a first monomer including an aryl ether ketone and (b) a second monomer including an aryl ether ketone and a first phenylethynyl moiety, each of the one or more polyaryletherketone copolymers having two terminal ends, each terminal end having a phenylethynyl moiety the same as or different from the first phenylethynyl moiety. 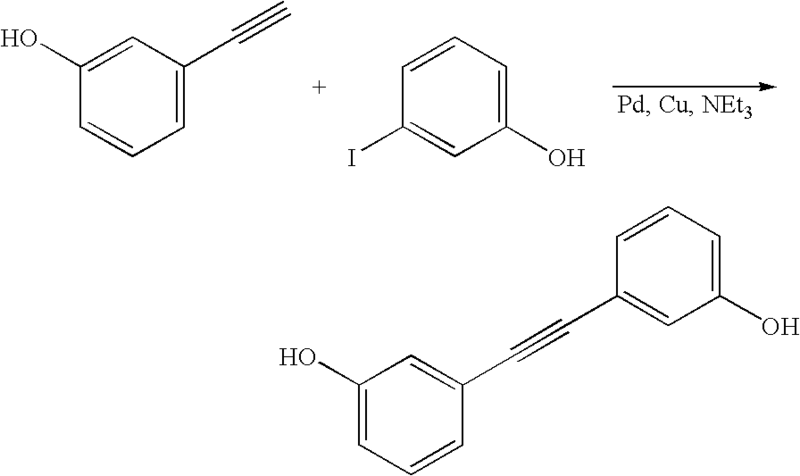 A second aspect of the present invention is a method, forming a layer of polyaryletherketone resin by applying a layer of one or more polyaryletherketone copolymers and thermally curing the layer of one or more polyaryletherketone copolymers, each of the one or more polyaryletherketone copolymers comprising (a) a first monomer including an aryl ether ketone and (b) a second monomer including an aryl ether ketone and a first phenylethynyl moiety, each of the one or more polyaryletherketone copolymers having two terminal ends, each terminal end having a phenylethynyl moiety the same as or different from the first phenylethynyl moiety, and bringing a thermal-mechanical probe heated to a temperature of greater than about 100° C. into proximity with the layer of a polyaryletherketone resin multiple times to induce deformed regions at points in the layer of the polyaryletherketone resin, the polyaryletherketone resin the thermal mechanical probe heating the points in the layer of the resin and thereby writing information in the layer of the resin. A third aspect of the present invention is a data storage device, comprising: a recording medium comprising a layer of polyaryletherketone resin overlying a substrate, in which topographical states of the layer of the polyaryletherketone resin represent data, the polyaryletherketone resin comprising thermally cured one or more polyaryletherketone copolymers, each of the one or more polyaryletherketone copolymers comprising (a) a first monomer including an aryl ether ketone and (b) a second monomer including an aryl ether ketone and a first phenylethynyl moiety, each of the one or more polyaryletherketone copolymers having two terminal ends, each terminal end having a phenylethynyl moiety the same as or different from the first phenylethynyl moiety; a read-write head having one or more thermo-mechanical probes, each of the one or more thermo-mechanical probes including a resistive region for locally heating a tip of the thermo-mechanical probe in response to electrical current being applied to the one or more thermo-mechanical probes; and a scanning system for scanning the read-write head across a surface of the recording medium. FIGS. 1A through 1C illustrate the structure and operation of a tip assembly 100 for a data storage device including the data storage medium according to the embodiments of the present invention. In FIG. 1A, probe tip assembly 100 includes a U-shaped cantilever 105 having flexible members 105A and 105B connected to a support structure 110. Flexing of members 105A and 105B provides for substantial pivotal motion of cantilever 105 about a pivot axis 115. Cantilever 105 includes an indenter tip 120 fixed to a heater 125 connected between flexing members 105A and 105B. Flexing members 105A and 105B and heater 125 are electrically conductive and connected to wires (not shown) in support structure 110. In one example, flexing members 105A and 105B and indenter tip 120 are formed of highly-doped silicon and have a low electrical resistance, and heater 125 is formed of lightly doped silicon having a high electrical resistance sufficient to heat indenter tip 120, in one example, to between about 100° C. and about 500° C. when current is passed through heater 125. The electrical resistance of heater 125 is a function of temperature. Also illustrated in FIG. 1A is a storage medium (or a recording medium) 130 comprising a substrate 130A, and a cured polyaryletherketone resin layer 130B. In one example, substrate 130A comprises silicon. Cured polyaryletherketone resin layer 130B may be formed by solution coating, spin coating, dip coating or meniscus coating polyaryletherketone copolymer and reactive diluent formulations and performing a curing operation on the resultant coating. 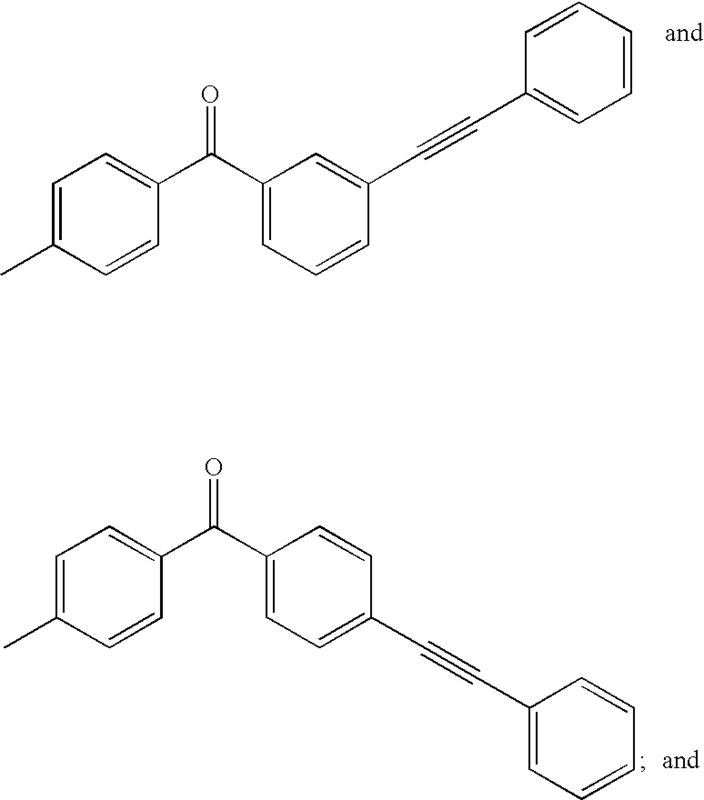 In one example, cured polyaryletherketone resin layer 130B has a thickness between about 10 nm and about 500 nm. 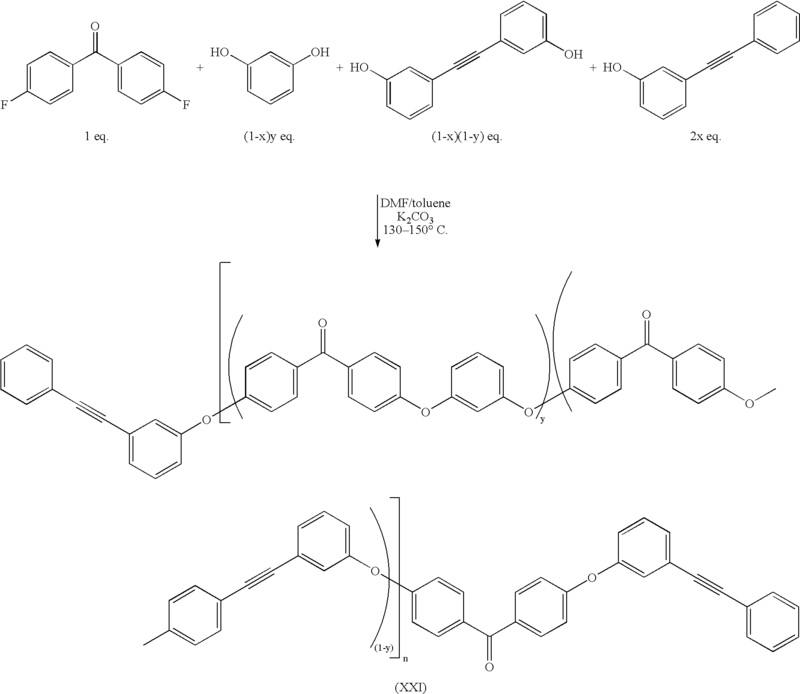 The composition of cured polyaryletherketone resin layer 130B is described infra. An optional penetration stop layer 130C is shown between cured polyaryletherketone resin layer 130B and substrate 130A. Penetration stop layer 130C limits the depth of penetration of indenter tip 120 into cured polyaryletherketone resin layer 130B. Turning to the operation of tip assembly 100, in FIG. 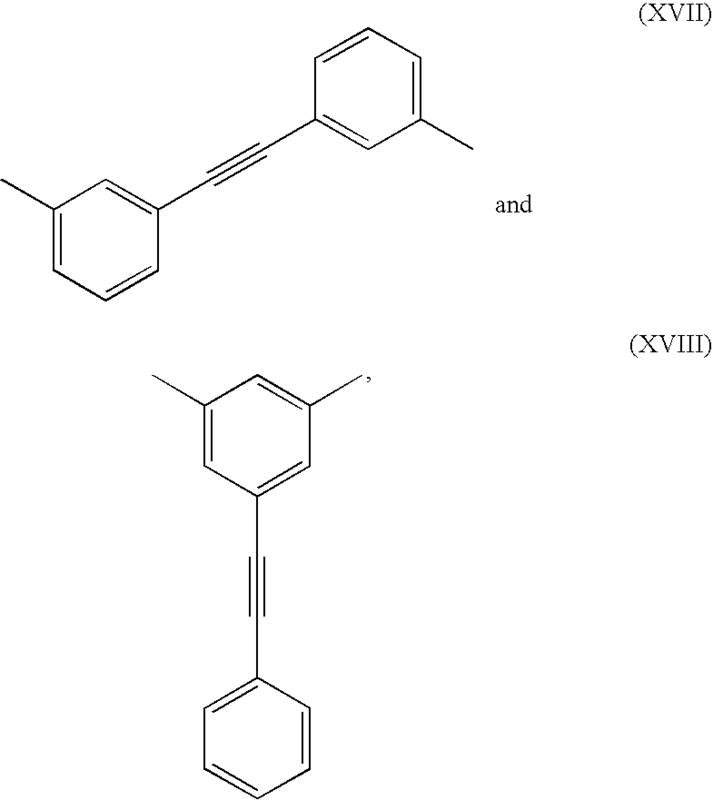 1A, an indentation 135 is formed in cured polyaryletherketone resin layer 130B by heating indenter tip 120 to a writing temperature TW by passing a current through cantilever 105 and pressing indenter tip 120 into cured polyaryletherketone resin layer 130B. Heating indenter tip 120 allows the tip to penetrate the cured polyaryletherketone resin layer 130B forming indentation 135, which remains after the tip is removed. In a first example, the cured polyaryletherketone resin layer 130B is heated by heated indenter tip 120, the temperature of the indenter tip being not greater than about 500° C., to form indentation 135. 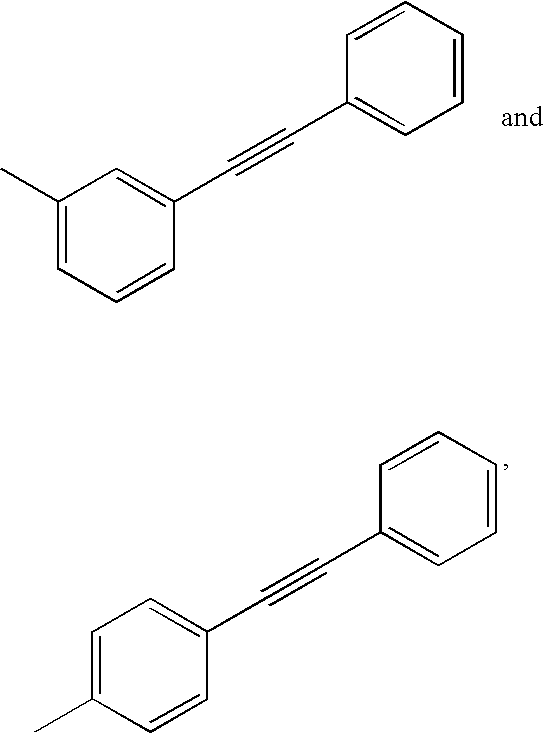 In a second example, the cured polyaryletherketone resin layer 130B is heated by heated indenter tip 120, the temperature of the indenter tip being not greater than about 400° C., to form indentation 135. In a third example, the cured polyaryletherketone resin layer 130B is heated by heated indenter tip 120, the temperature of the indenter tip being between about 200° C. and about 500° C., to form indentation 135. In a fourth example, the cured polyaryletherketone resin layer 130B is heated by heated indenter tip 120, the temperature of the indenter tip being between about 100° C. and about 400° C., to form indentation 135. As indentations 135 are formed, a ring 135A of cured polyaryletherketone resin is formed around the indentation. Indentation 135 represents a data bit value of “1”, a data bit value of “0” being represented by an absence of an indentation. Indentations 135 are nano-scale indentations (several to several hundred nanometers in width). FIGS. 1B and 1C illustrate reading the bit value. In FIGS. 1B and 1C, tip assembly 100 is scanned across a portion of cured polyaryletherketone resin layer 130B. 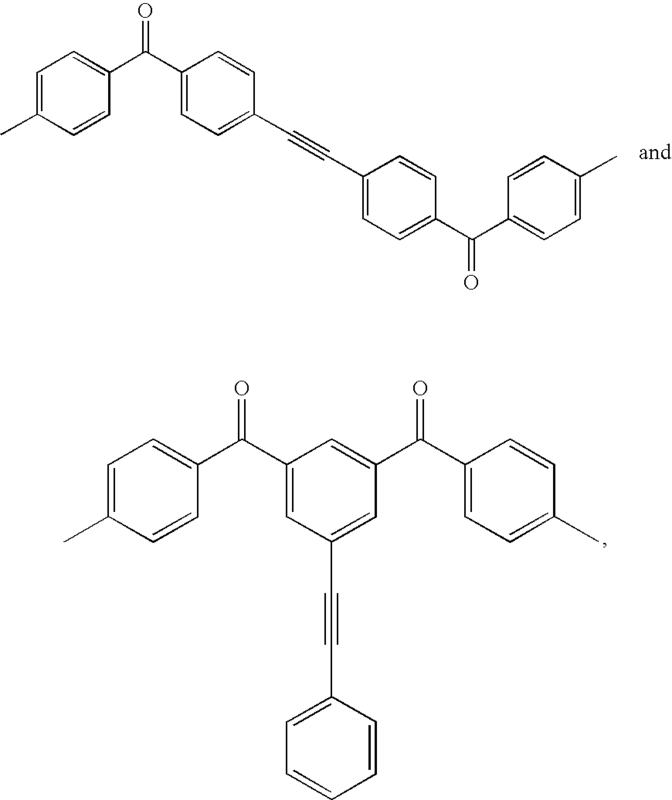 When indenter tip 120 is over a region of cured polyaryletherketone resin layer 130B not containing an indentation, heater 125 is a distance D1 from the surface of the cured polyaryletherketone resin layer (see FIG. 1B). 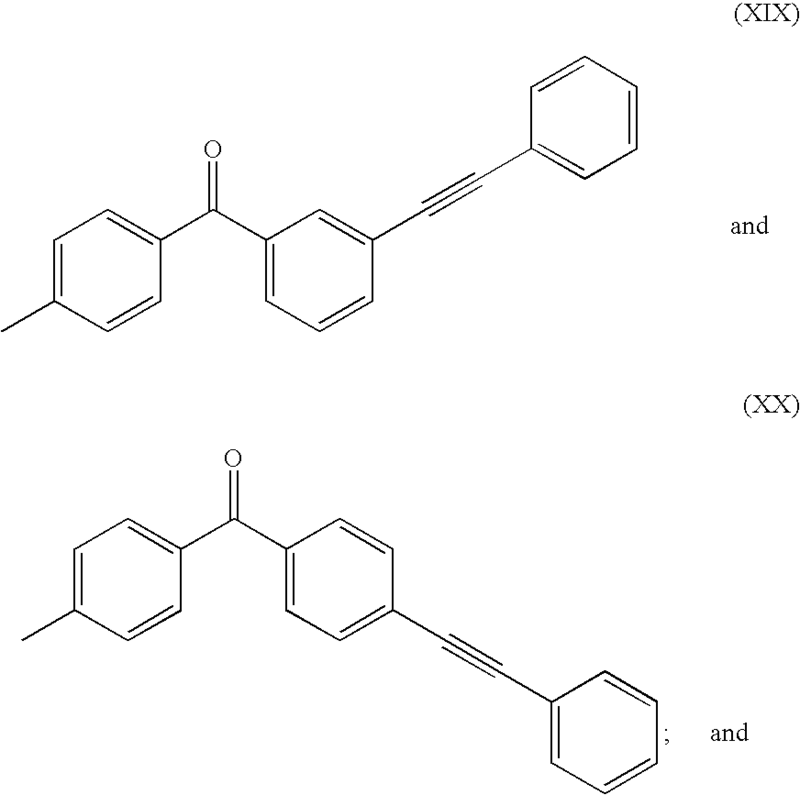 When indenter tip 120 is over a region of cured polyaryletherketone resin layer 130B containing an indentation, heater 125 is a distance D2 from the surface of the cured polyaryletherketone resin layer (see FIG. 1C) because the tip “falls” into the indentation. D1 is greater than D2. If heater 125 is at a temperature TR (read temperature), which is lower than TW (write temperature), there is more heat loss to substrate 130A when indenter tip 120 is in an indentation than when the tip is not. This can be measured as a change in resistance of the heater at constant current, thus “reading” the data bit value. It is advantageous to use a separate heater for reading, which is mechanically coupled to the tip but thermally isolated from the tip. A typical embodiment is disclosed in Patent Application EP 05405018.2, 13 Jan. 2005. “Erasing” (not shown) is accomplished by positioning indenter tip 120 in close proximity to indentation 135, heating the tip to a temperature TE (erase temperature), and applying a loading force similar to writing, which causes the previously written indent to relax to a flat state whereas a new indent is written slightly displaced with respect to the erased indent. The cycle is repeated as needed for erasing a stream of bits whereby an indent always remains at the end of the erase track. TE is typically greater than TW. The erase pitch is typically on the order of the rim radius. In a first example, the cured polyaryletherketone resin layer 130B is heated by heated indenter tip 120, the temperature of the indenter tip is not greater than about 500° C., and the erase pitch is 10 nm to eliminate indentation 135. 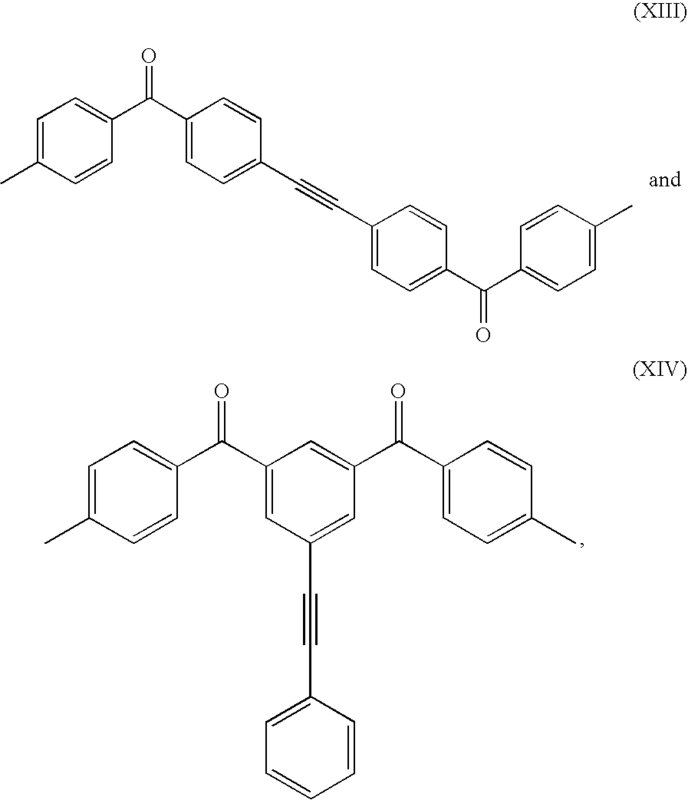 In a second example, the cured polyaryletherketone resin layer 130B is heated by heated indenter tip 120, the temperature of the indenter tip is not greater than about 400° C., and the erase pitch is 10 nm to eliminate indentation 135. In a third example, the cured polyaryletherketone resin layer 130B is heated by heated indenter tip 120, the temperature of the indenter tip is between about 200° C. and about 400° C., and the erase pitch is 10 nm to eliminate indentation 135. In a fourth example, the cured polyaryletherketone resin layer 130B is heated by heated indenter tip 120, the temperature of the indenter tip is between about 200° C. and about 500° C., and the erase pitch is 10 nm to eliminate indentation 135. FIG. 2 is an isometric view of a local probe storage array 140 including the data storage medium according to the embodiments of the present invention. In FIG. 2, local probe storage array 140 includes substrate 145 having a cured polyaryletherketone resin layer 150 (similar to cured polyaryletherketone resin layer 130B of FIGS. 1A, 1B and 1C), which acts as the data-recording layer. An optional tip penetration stop layer may be formed between cured polyaryletherketone resin layer 150 and substrate 145. In one example, substrate 145 comprises silicon. Cured polyaryletherketone resin layer 150 may be formed by solution coating, spin coating, dip coating or meniscus coating uncured polyaryletherketone resin formulations and performing a curing operation on the resultant coating. In one example, cured polyaryletherketone resin layer 150 has a thickness between about 10 nm and about 500 nm and a root mean square surface roughness across a writeable region of cured polyaryletherketone resin layer 150 of less than about 1.0 nm across the cured polyaryletherketone resin layer. The composition of cured polyaryletherketone resin layer 150 is described infra. Positioned over cured polyaryletherketone resin layer 150 is a probe assembly 155 including an array of probe tip assemblies 100 (described supra). Probe assembly 155 may be moved in the X, Y and Z directions relative to substrate 145 and cured polyaryletherketone resin layer 150 by any number of devices as is known in the art. Switching arrays 160A and 160B are connected to respective rows (X-direction) and columns (Y-direction) of probe tip assemblies 100 in order to allow addressing of individual probe tip assemblies. Switching arrays 160A and 160B are connected to a controller 165 which includes a write control circuit for independently writing data bits with each probe tip assembly 100, a read control circuit for independently reading data bits with each probe tip assembly 100, an erase control circuit for independently erasing data bits with each probe tip assembly 100, a heat control circuit for independently controlling each heater of each of the probe tip assembles 100, and X, Y and Z control circuits for controlling the X, Y and Z movement of probe assembly 155. The Z control circuit controls a contact mechanism (not shown) for contacting the cured polyaryletherketone resin layer 150 with the tips of the array of probe tip assemblies 100. During a write operation, probe assembly 155 is brought into proximity to cured polyaryletherketone resin layer 150 and probe tip assemblies 100 are scanned relative to the cured polyaryletherketone resin layer. Local indentations 135 are formed as described supra. Each of the probe tip assemblies 100 writes only in a corresponding region 170 of cured polyaryletherketone resin layer 150. This reduces the amount of travel and thus time required for writing data. During a read operation, probe assembly 155 is brought into proximity to cured polyaryletherketone resin layer 150 and probe tip assemblies 100 are scanned relative to the cured polyaryletherketone resin layer. Local indentations 135 are detected as described supra. Each of the probe tip assemblies 100 reads only in a corresponding region 170 of cured polyaryletherketone resin layer 150. This reduces the amount of travel and thus the time required for reading data. During an erase operation, probe assembly 155 is brought into proximity to cured polyaryletherketone resin layer 150, and probe tip assemblies 100 are scanned relative to the cured polyaryletherketone resin layer. Local indentations 135 are erased as described supra. Each of the probe tip assemblies 100 reads only in a corresponding region 170 of cured polyaryletherketone resin layer 150. This reduces the amount of travel and thus time required for erasing data. Additional details relating to data storage devices described supra may be found in the articles “The Millipede—More than one thousand tips for future AFM data storage,” P. Vettiger et al., IBM Journal of Research and Development. Vol. 44 No. 3, May 2000 and “The Millipede—Nanotechnology Entering Data Storage,” P. Vettiger et al., IEEE Transaction on Nanotechnology, Vol. 1, No. 1, March 2002. See also U.S. patent Publication 2005/0047307, Published Mar. 3, 2005 to Frommer et al. and U.S. patent Publication 2005/0050258, Published Mar. 3, 2005 to Frommer et al., both of which are hereby included by reference in their entireties. Turning to the composition of cured polyaryletherketone resin layer 130B of FIGS. 1A through 1C. It should be understood that for the purposes of the present invention curing a polymer implies cross-linking the polymer to form a cross-linked polymer or resin. The polyaryletherketone resin medium or imaging layer of the embodiments of the present invention advantageously meets certain criteria. These criteria include high thermal stability to withstand millions of write and erase events, low wear properties (little or no pickup of material by tips), low abrasion (tips do not easily wear out), low viscosity for writing, glassy character with no secondary relaxations for long data bit lifetime, and shape memory for erasability. 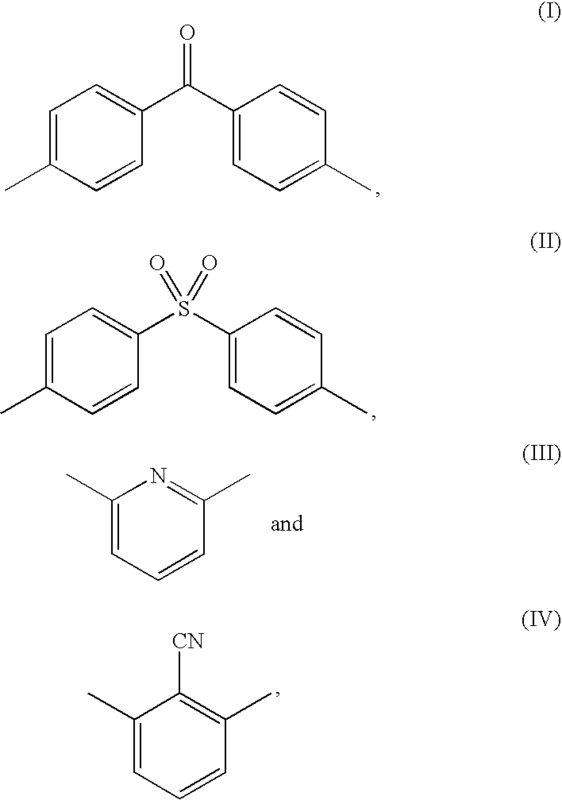 Cured polyaryletherketone resins according to embodiments of the present invention have high temperature stability while maintaining a low glass transition temperature (Tg). 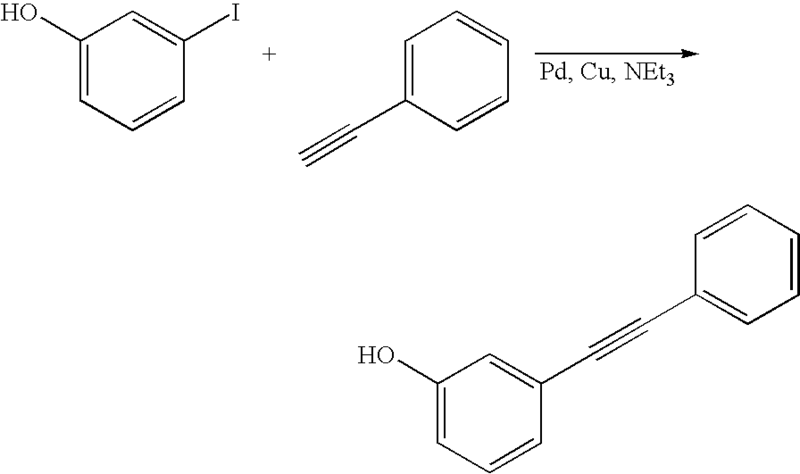 In a first example, cured polyaryletherketone resins according to embodiments of the present invention have a Tg of less than about 180° C. In a second example, cured polyaryletherketone resins according to embodiments of the present invention have a Tg of between about 100° C. and about 180° C.
The glass transition temperature should be adjusted for good write performance. To optimize the efficiency of the write process there should be a sharp transition from the glassy state to the rubbery state. A sharp transition allows the cured resin to flow easily when a hot tip is brought into contact and quickly return to the glassy state once the hot tip is removed. However, too high a Tg leads to high write currents and damage to the probe tip assemblies described supra. wherein m is an integer of 2 or more, n is an integer of 1 or more, m is greater than n and m+n is from about 5 to about 50. The molar ratio of a first repeat unit (containing R1 and R2 groups) to a second repeat unit (containing either R1 and R5 groups or R3 and R2 groups) in structures (i), (ii), (iii) and (iv) is kept greater than 1, therefore the ratio m/n is greater than 1. 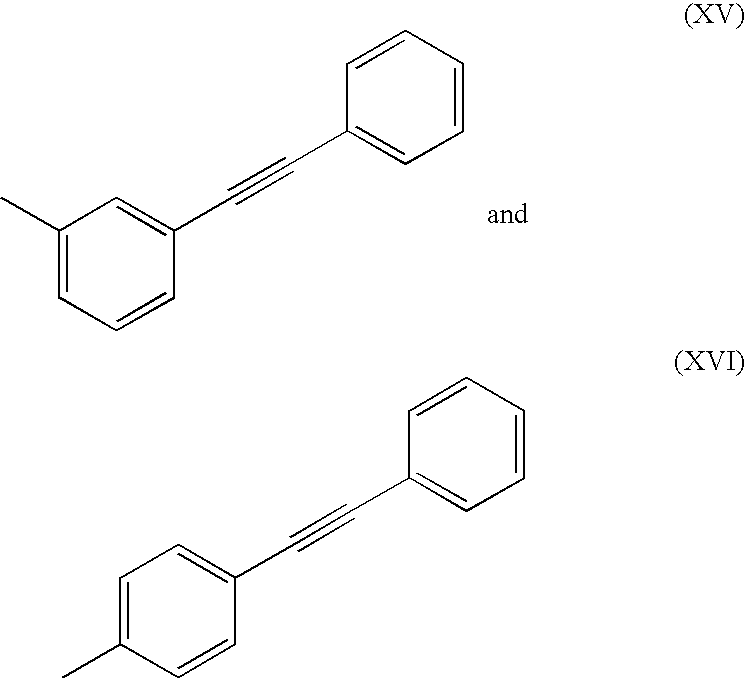 The acetylene moieties in the R3, R4, R5, and R6 groups, whichever are present, react during thermal curing with each other to cross-link the polyaryletherketone copolymers into a polyaryletherketone resin by cyclo-addition. In a first example, polyaryletherketone copolymers according to embodiments of the present invention advantageously have a molecular weight between about 3,000 Daltons and about 10,000 Daltons. In a second example, polyaryletherketone copolymers according to embodiments of the present invention advantageously have a molecular weight between about 4,000 Daltons and about 5,000 Daltons. All materials were purchased from Aldrich and used without further purification unless otherwise noted. To a suspension of 3-iodophenol (3.73 gram, 17 mmol), PdCl2(PPh3)2 (120 mg), CuI (161 mg), and PPh3 (333 mg) in NEt3 (100 mL) under N2 was added a solution of 3-hydroxyphenylacetylene (2.00 gram, 17 mmol) in NEt3 (10 mL). The mixture was stirred and heated to 70° C. using an oil bath for 18 h. Excess NEt3 was removed under reduced pressure, and the remaining solids were extracted with 4×50 mL diethyl ether which was then filtered and evaporated. The crude product was purified by suspending in 80 mL CH2Cl2, stirring for 1 hour, and filtering to give the final product as a yellow powder (2.96 g, 83% yield). In a multi-necked flask equipped with a mechanical stirring apparatus and a Dean-Stark trap, 4,4′-difluorobenzophenone (1.4187 gram, 6.502 mmol), resorcinol (0.5326 g, 4.838 mmol), 3,3′-dihydroxydiphenylacetylene (0.2540 g, 1.209 mmol), 3-hydroxydiphenylacetylene (0.1753 g, 0.9037 mmol), and potassium carbonate (3 g, 22 mmol) were suspended in a mixture of dimethylformamide (DMF) (10 mL) and toluene (20 mL). The reaction mixture was vigorously stirred and heated to 130° C. for 16 hours under a slow flow of dry nitrogen, and toluene was removed periodically via the Dean-Stark trap. At the end of the 16 h period, the temperature was increased to 150° C. for another 8 hours. The reaction was then cooled and the polymer was isolated by multiple precipitations using THF and methanol. Molecular weights were adjusted by using different proportions of (R1+R2) to (R3) and several different molecular weight polymers were prepared. Thus, the embodiments of the present invention provide for compositions of matter for the storage media that operate in the nanometer regime. wherein said curing is performed at a temperature between about 300° C. and about 400° C.
wherein R4 is selected from the group consisting of mono(arylacetylenes). 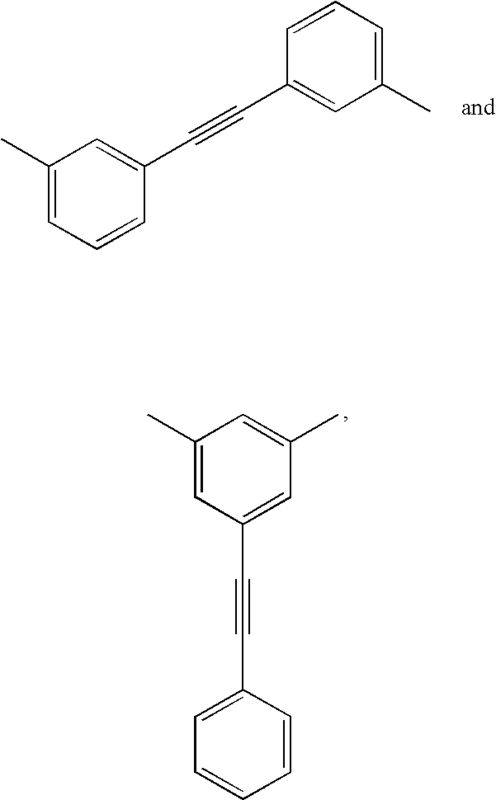 mono(phenylethynyls).